Managers of an airport in north-central Vietnam confirmed on Friday that a female ground service employee of budget carrier Vietjet was assaulted by three young men at the airdrome the same day. The incident was made known to the public via a video that went viral on social media, which shows a group of three men beating and slapping the woman in the face. 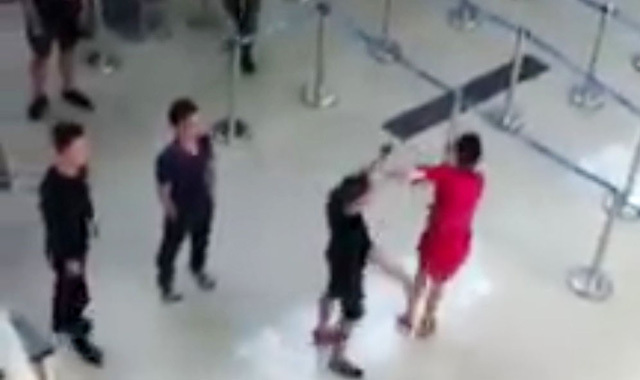 The ground service employee eventually fell to the ground after receiving a kick from one of the attackers, according to the two-minute footage seen by Tuoi Tre News. The violent men also noticed that a coworker of the victim had been filming their act and turned to shout at and verbally attack her. A representative of Tho Xuan Airport, located in Thanh Hoa Province, confirmed to Tuoi Tre (Youth) newspaper on Friday afternoon that the incident took place at the airport. Vietjet also said in a statement that the men involved were identified as Pham Huu A., Le Van Nh., and Le Trung D., who came to Tho Xuan to bid goodbye to their friend, Le Sy M., who boarded a Vietnam Airlines flight for Ho Chi Minh City at 3:05 that day. After M. completed check-in, the three asked the Vietjet employee, Le Thi Gi., to take a group photo of them at the departure hall. M. accepted the request, only to see the men continue asking her to join them for another group photo. This time the woman refused, saying she had to work. Shortly after hearing Gi.’s refusal, the three men started to attack her, first verbally and later physically. A. used his mobile phone to beat Gi. in her head and slapped her, whereas Nh. Also hit her in the face with his hand. An airport manager witnessed the attack and tried to stop the men, only to receive a slap in her face and a kick to her abdomen. D., one of the attackers, also hit two airport security officers. The three were eventually arrested when airport security was reinforced by police from the province’s Tho Xuan District. The case was booked and Tho Xuan police are investigating further.